Everyone loves a home tour, right? What about a virtual homestead tour? A chance to meet another fellow homesteader and ask a few questions to get a glimpse into their life? Oh, yeah! 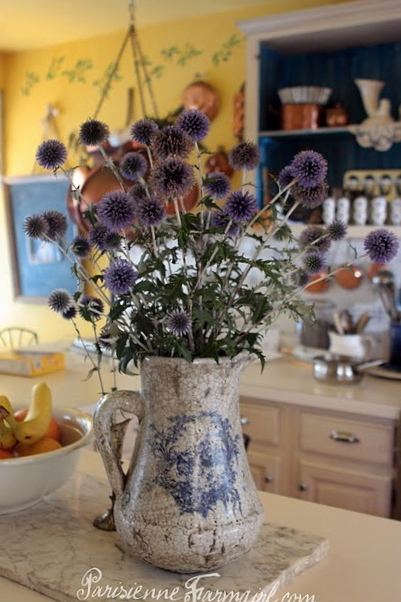 • Your beautiful blog blends all things French with homesteading in a wonderfully unique way! I understand you took a very inspiring trip to Paris which made a big impact on your life and obviously it comes through in your blog. Tell us a bit about that experience. • Did you grow up homesteading or has this been something you’ve had to teach yourselves? When I was a child my Mom did can pickles, we would go pick rubarb, she made jam from the neighbors grapevines but I don't know that it was with the intent of saving the family money or for expressing a self-sufficiant attitude. The memories are very warm for me but as far as "homesteading" that is something I am teaching myself. 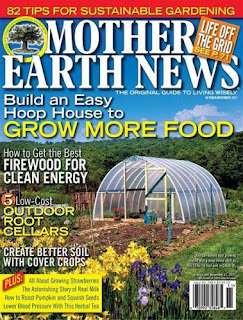 • What are the best resources you’ve found for learning in terms of homesteading? I'm a Google girl. My "MacTop" is always open on my countertop (and is thus covered in kitchen goo all the time). I am so curious about everything and forever Googling what it is I want to know. I would rather learn from someone else's mistakes - with three and any day now four little ones I don't have time for flubs. I read REALLY fast and easily scan three or four articles about the same inquiry and then try it for myself. 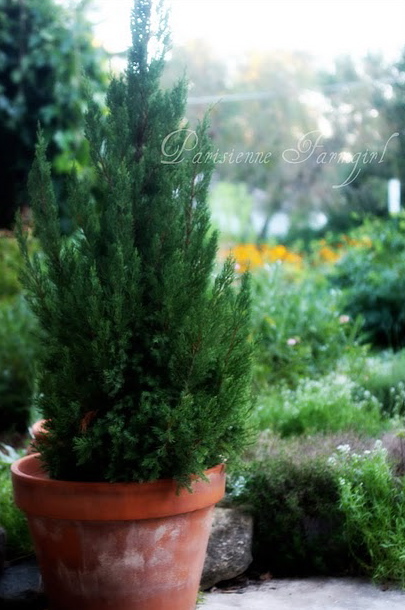 • Your garden is a big part of your homestead and based on the French concept of a potager. For those who are new to that term, how would you define a potager and how does your own garden reflect that? 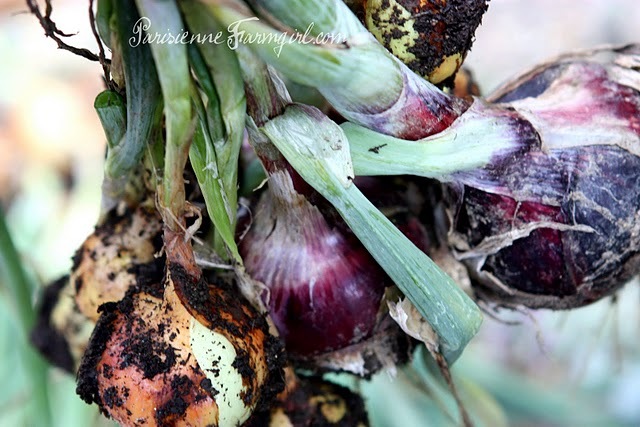 "Potager" has become a pretty popular term now thanks to blogland. Simply put a Potager is a decorated vegetable garden. Not as utilitarian as the farm gardens of our great grandmothers. It incorporates structure, raised beds, edible flowers and more. We have had ours for about seven years now. 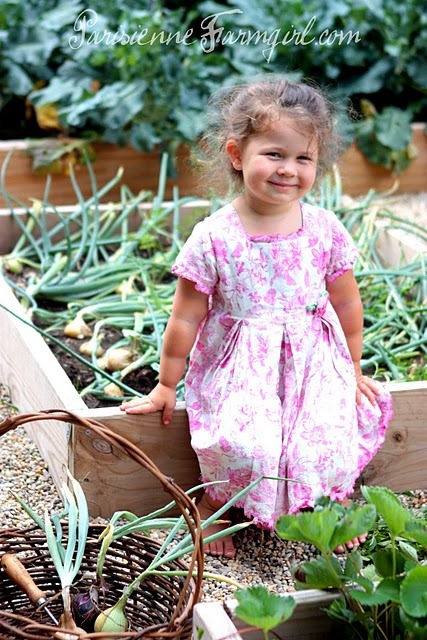 • Can you share what gardening zone you’re in, what you’re growing this summer, and if you’re planning on any fall crops? We are in zone five and I have never tried a fall garden. Gardening is a ton of work and I do get burned by fall out as much as I love it. This year though I will be planting spinach, another round of lettuce and garlic - which, I know is not a big deal but it is pretty exciting for me to try a fall garden. • Any long term future plans for your garden that you’d like to share? We did the big expansion last year and there is literally no more room - unless I dig up the city parkway... which I would if I could. The next step is going to be a "for sale" sign in the yard and Lord willing, a Hobby Farm. • You did a series of posts this past year on Potager 101. Do you have plans to expand this and develop it for publication in the future? Do I have plans for publication? That question haunts me as I have about 3 things in the cooker right now, one is a journaled account of my time in Paris... it's just having/taking the time to do the illustrations the way I would like to. I would love to publish my Teach Your Kids to Eat posts, write a book on making French Macarons and now that you mention it... expanding the Potager posts sounds fun too! See, that is why God made Midwest winters! As much as I detest them, they give you the chance to move on to other projects! 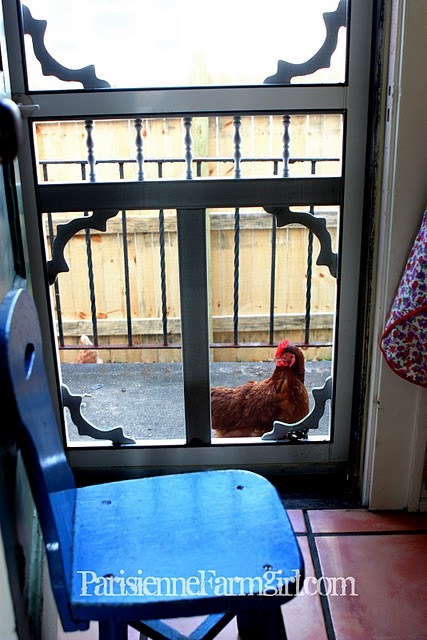 • Tell us about your chickens and their unique coop arrangement. Our chickens are a "no-no" in our town so we built a coop in our garage and they "free-range" in a nice 10x30' run along the side our our house. Our coop is nothing fancy. We built it out of two by fours, old kitchen cupboard doors and old doors from our house. We can walk in on one side to collect eggs and feed them and walk in on the other side so clean up under the roosting bar. Sadly, after ten months of having our girls our neighbor turned us in a couple weeks ago but I haven't parted with them yet. There is a movement underway in town now and one of many votes will take place September 8th. We don't plan on getting rid of them either way though. * Note: Angela has since had a reprieve from her local authorities while they work on new ordinances. A hilarious read is her post "Introducing... the City Chicks". • Cooking is obviously another passion for you. And recently, you were featured in Where Women Cook. Where did you learn to enjoy the kitchen and making culinary delights? I love food. I love to eat. And I am a bit of a control freak. I realized a long time ago that I didn't want to wait for that special occasion night on the town to eat wonderful food... I needed to learn myself. It's a process that is for sure. The other day I made something from an internet recipe and when it was done I clearly questioned my own sanity and reading comprehension. My guests were gracious enough to say it was wonderful but I wanted to crawl under the harvest table if you know what I mean. For the most time though, my time in the kitchen is "trial and success" VS trial and error. • What kind of cuisine do you like to cook the most and do you have a recipe or dish your family claims as a favorite? Most of my cookbooks are French. Go figure. 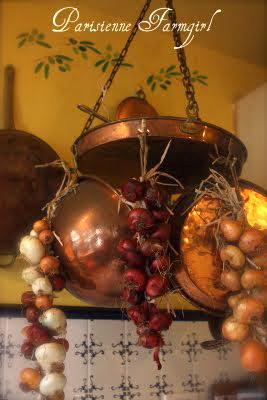 But there are so many regions and tastes to French cooking it is truly wonderful. It's not about frog legs. It's about fresh produce, legumes, lots of herbs and juicy cuts of beef. My family gets giddy when I make pork loin with blue cheese. They go crazy. • Your kitchen is a beautiful gathering spot that you’ve taken great care to make special. What brings you the most joy about this space? I think it's the life that takes place in the kitchen that makes it so wonderful. It can vary from children, loud and swinging from the chandeliers to the quiet moments when I have it all clean at the end of the day and I get to light a candle and rest. As utilitarian as it is, I do think it's a pretty space. I love the dried herbs and old books... the tarnished silver and copper. But it really is the heart of the home, it's where we spend most of our time as a family. • With three young children and one on the way, what does a typical day look like at your place? Oh goodness. Hubby works the afternoon/evening shift and our youngest sleeps later than the other two ever did so we get a bit of a late start as compared to families who have to get out the door in the morning. The two "big kids" are usually up by 6:30 and God bless them, they play in their rooms or together until they hear the baby (19 months) wake up or they can't take it anymore. Then it's "Family Snuggle", an all out pile of arms and legs... all five of us, the kids fighting for a space next to Mom and Dad. We usually make it down to the kitchen by 8:00 a.m. and I make a big breakfast of pancakes or some egg creation since we don't get to have dinner together but twice a week. I am teaching the kids to help clean up, wipe counters, sweep... but the second they are done they are out the door headed for their bikes or the garden to find frogs and whatever else they can. Non-pregnant this is when I work out but I get so sick I always take my pregnancies "off". Once we start school on October 1st (I am due the 15th of September so there is no sense to begin before) the morning schedule will have my workouts done and school starting by 9:30. We'll go 'til 11:30 and eat another meal with Joel before he leaves for work. The kids rest or nap depending on their age from 1-3 p.m. and that is when I go crazy out in the garden or on whatever project I am in the middle of. Aidan often ends up by my side, then the screen door slams as Amélie stumbles out of the house after her nap... this fall we will keep our ears open for the two little ones to wake up next. Dinner is pretty simple in our house since it's just the kids and I. We ALWAYS sit down together but I save my creative big dinners for Joel's day's off. Then we wind down... the little ones are down by six-thirty and then the kids and I will read their Jesus Story Book Bible and usually a Laura Ingalls book. We are reading the series for the third time in two years. Farmer Boy right now... that's the best one! Bed time with three and now four is a lot for one Momma and I am always trying to keep it warm and cozy but moving along so I can crash! After the kids are down I relax with my computer or journal or tinker with a project. I try to stay up 'til Joel get's home but if 11:00 hit's and he isn't ready to pull in the driveway I have to will myself to get to sleep. It get's a bit lonely but we are grateful for the job and any day now I will have a sweet little baby to keep me company. • When do you fit in time for blogging and reading other blogs? And about how long do you allow yourself on the computer daily? I only post 2-4 times per week. It's just too much with small children, I could multi-task all day long and come back and forth to it but then it's like an obsession and I just can't have that. I would LOVE to spend more time changing up my blog, reading others, commenting... but I am not in that season right now. Any day now I am going to have four children ages six and under. The reality is they need to see my face looking at them, not glancing over at a computer screen every spare minute. Blogging can get really competitive too and I think that's pretty silly. You have to blog with sincerity. If you are running around commenting on everyone's blog just so they will come and comment on yours??? Come on, we need to grow up. I check my email and comments about 4 times a day. That takes me about 5 minutes. I've said "no" to things like Facebook and Twitter from the beginning. I just don't want to live my life in front of a computer - and I could easily because I LOVE the creative aspect of it! •Any skills or goals you hope to tackle and learn in the next couple of years? Oh that's a big question for me. What don't I want to know how to do??? Seriously, I do want to learn to Irish Dance a bit and would that I could I would go back to Tango lessons (if hubby would go for it)! I have always lost my baby weight in a timely fashion and now I am mentally revving up to do that again. And boy, does that take some mental revving!!! After I do I am going to become a Turbo Jam instructor because I think that would just be HILARIOUS! I hope to improve my seedling/greenhouse skills... they seem so hit or miss. I would love to go back to playing the piano and I just found a French teacher in our po-dunk town so I am anxious to see how much lessons are. Oh, and oil painting, watercolor and maybe how to shoot a gun...should I go on??? • What advice would you share for someone wanting to make their own home a special haven for their family? Consider the memories you want your children to have. I have a mental list running... Access to books, music playing, Momma in an apron, Momma looking pretty (not haggled and worn down), homemade jammies at Christmas, homemade birthday dresses, creative time killers like homemade playdo and cardboard box forts... home, home, home... not memories of being on the go all the time. As far as your husband, he is out there fighting for you all day - what do you want him to crave coming home to? A fragrant house (and wife for that matter), good food, maybe a fresh pot of coffee or a cold beer, a wife that is pleased by pleasing him... It's about creating an environment for the people you love to thrive in. Creating a place they can't WAIT to be a part of or come home to. It's an AMAZING opportunity... to shape and influence such a profound part of someone's life. Thanks, Angela! It's been fun to take a peak inside your life! You're not only tackling many of your goals, but you're nailing them! 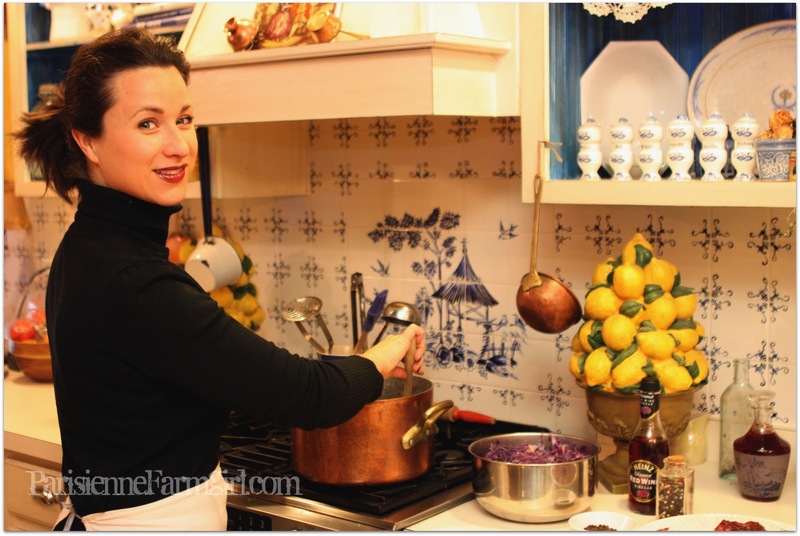 I love how homey your kitchen sounds and the fact that you dress nice just for your family! They will surely have many wonderful memories. 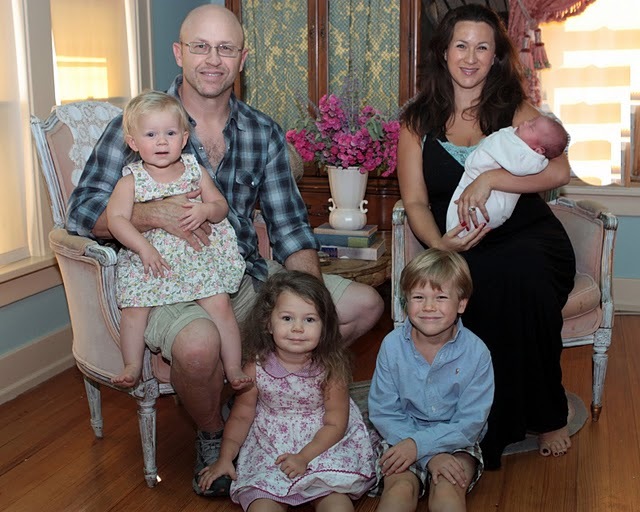 Congratulations on the newest family member and may His good blessings abound within your home! 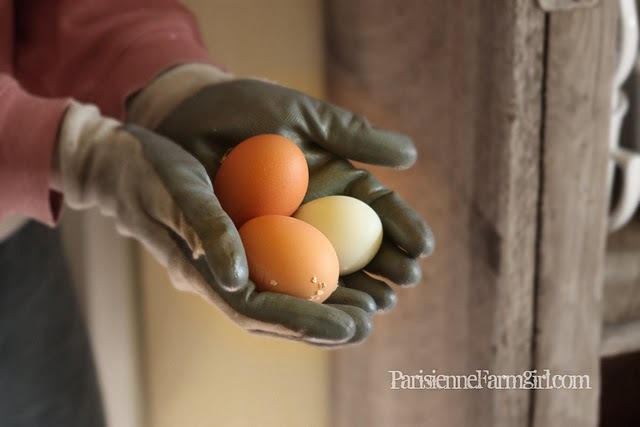 Be sure to visit Angela at Parisienne Farmgirl and say Bonjour ami! As you may recall, we recently had several fires in our area. While we were blessed that not many homes were lost, there was a lot of smoke. And repercussions one might not expect. "On September 9, 2011, multiple lightning strikes started a series of wild fires in my mountain area. I have a single hive of Italian Honey bees who are being kept in a natural habitat of native chaparral, wild flowers, pine trees, sage and oak trees. They also forage from my small apple orchard, black berries, lavender and other bee friendly plants. This is a very strong hive in its 2nd year. I have been filling their in-hive feeder with syrup made of organic evaporated cane juice about once every other week in the last couple of months, due to nectar flow being low. When smoke filled the area on September 9, I had already harvested a full super of honey earlier that summer, and there was a 2nd full and capped supers on the hive. There was also a 3rd which was partially full, uncapped and unripe honey. My intent was to harvest more of the capped honey very soon, being careful to take only the surplus, so that the bees would have more than enough for the hard winter ahead. I had also planned to store some of the capped frames in my ice chest in the winter to have on hand for extra energy, should the bees need it in the dearth of winter. This has been my method of winter feeding and it has worked very well. Last year, in a very severe winter, they needed 6 extra frames and I could see that there was more than enough to do this again this year. After the fires were out, and all smoke had subsided, I decided to check on my bees. I went out with my syrup, ready to fill the super, and what I found astounded me. I had expected to find the 2nd super still full and the 3rd super partially capped. Instead, I found the sugar syrup feeder partially full, but half of all the honey was gone! That's right... the bees had consumed a large amount of honey in a very short time. Although the bees seemed fine with brood rearing going strong and large amounts of pollen readily available, I did notice a dip in overall population of about 25% less bees and even fewer drones. This is not unusual for this time of year, but the more I thought about it, the more I realized, these bees had consumed large amounts of their honey in order to evacuate the hive during the fires. 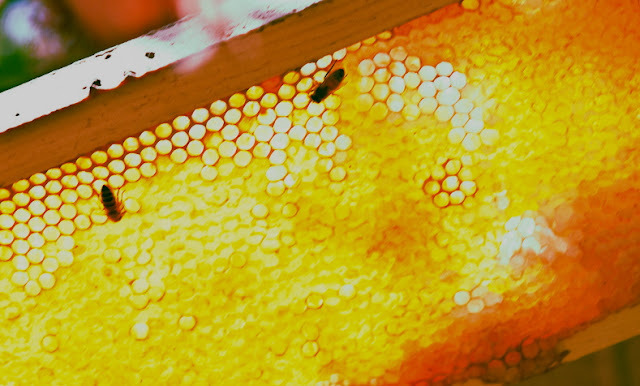 The massive amounts of smoke had alerted them to get away and fuel up on honey! They consumed enough to leave and then when all was safe, made their way back to their home! I find this truly remarkable and I wanted to share it with you to show how amazing these creatures truly are! I can't tell you how relieved I am... first, that they survived this terrible ordeal, but also I'm thankful that I didn't remove the honey before the fire. I had no way of knowing there would be a fire and that the surplus honey would make the difference between their survival and their demise. 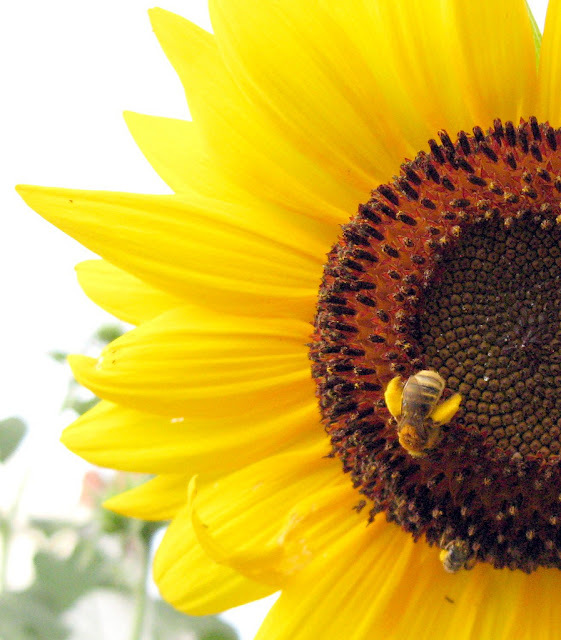 I believe that God is teaching me through the bees that He is the Maker and Master of all. We are mere observers and learners of His wonderful universe and what a joy it is to acknowledge His majesty through observing them." So there you have it. Fire means smoke, and smoke means bees are going to react. In all my emergency preparations, it never occurred to me that the bees would need help even if the fire didn't reach my area! The smoke alone can be an issue... what a great lesson to know in advance for next time, although I'm not sure there's much one can do in terms of evacuating the hive. More than once, Lori and I have discussed the fact that we typically have underestimated the need for bees to have plenty of their own honey. They must have food for those times they can't get out of the hive, whether it's due to cold, rain, or in this case... smok'in fires! This post has been linked to Farm Friend Friday! I was sure I had already posted this recipe on my blog, but going through my topic index, I couldn't find it. Everyone needs a good homemade mayo recipe, because you never know when you might run out and need some quick! Let me preface this recipe with the fact that I wanted one that was both soy-free and without sweeteners, such as high fructose corn syrup. Have you ever read the labels of the mayo in the store? Good luck finding a jar without at least ONE of these two ingredients! Trader Joe's may have one, but it's a bit expensive to say the least. You'll find this recipe much easier on the pocket book and better for your body. So if you're not going to use soy as an oil base, what are you going to use? There are all kinds of oils out there, but in my house, we only use olive oil or coconut oil (with rare occurrences of specialty oils such as sesame seed oil, walnut oil, etc.). Coconut oil just didn't seem like the right option, so I tried my usual extra virgin olive oil. Problem was... it just tasted like olive oil. Not what I wanted. I actually went out and purchased some grape seed oil and gave that a try. Not bad, but it wasn't great either. I still wasn't getting the mayo taste I wanted. Then it occurred to me that extra light olive oil might work. And sure enough... it was just the right oil (for me anyway!). You don't want the mayo to curdle, so take your time. If it does curdle, pour the mayo into a bowl and set aside, add another egg to the blender, turn the blender on and slowly add the curdled mayo back into the blender again. Honestly, I've never actually had it curdle, so it's not super finicky. Nice and smooth! And tasty!! This recipe makes 1 1/4 cups and keeps for about two weeks in the refrigerator, but I try to use it within the week, just to be on the safe side. I believe olive oil is a natural preservative, so it should be fine. So, I'm going to do something different here. If you have a mayo recipe you think is really outstanding, link it up below because it would be fun to try some different mayo recipes, don't you think? Why buy this stuff when it's so eeeeeasy to make? And I'd love a good mustard and ketchup recipe! Link those up if you've got one! 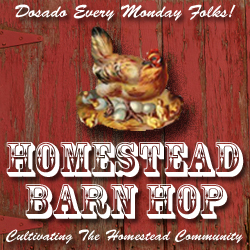 Welcome to the Monday Homestead Barn Hop, friends! Another week has come and gone and fall is now upon us. While the weather may not be cold or even cool yet, most of us can at least say it's cooler! Even those in the southern states were given a bit of a reprieve from the 100+ degree heat! It may seem like winter is still a long way off, but now is the time to start preparing, especially if you burn wood as a heat source! My family was blessed to find a couple of downed oak trees with the help of a friend (due to a combination of weather and insects) which will be the bulk of our heat this coming winter. I like to store the scraps in a metal garbage can, but this time, I'm going to need a lot more than one trash can! This month's issue of Mother Earth News (Oct./Nov. 2011) has an article on getting the most out of your firewood in case you want to pick up a copy on the newstand. I learned some good tips that I'm going to try out this year. So far, we've barely made a dent in our wood supply... lots more to split! What a wonderful problem to have!! Thankfully, we are not saved by our works (Ephesians 2:8-9)! But... work IS a blessing none-the-less! One of the things that makes it so great?... When a hard day's work is followed by REST! Rest in the LORD this good day, friends! Hello everyone! How are you doing this week getting prepared? I know a lot of people are canning this month, planting fall gardens, putting up season extenders, and purchasing other gardening items that are on sale as nursery centers hope to reduce stock for the winter. Be sure to share what you are doing with your garden this month! I have stuff planted, but still struggling getting seeds to sprout despite the day time temps being ideal. I think our nighttime temperatures are dipping too low (therefore not consistant enough) and it's keeping things from sprouting. Three or four from my homesteading group are taking the CERT class and they have us making GOODY pack (they call them Grab and Go bags). Although I have a bag, this one will be a bit different since it will concentrate on items to help with light search and rescue in our area as well personal needs. My original supply concentrated more on getting totally out of the area. By the way, we had lightening for a long time again last night (with a bit of rain, too!) and while it sparked 4 fires in our county, none were in our area. Our wonderful firemen have had a VERY busy month! I'm splitting wood today for our woodstove this winter. We were blessed to get wood from some downed trees from bad weather last year, but I need to get it split and stacked to see how much is really there. Last year, for the first time, we burned through all our wood. Perhaps that's a good thing... maybe that meant we didn't run the heater much! This year, I know I need more to really be prepared. All is well, but life is just a bit busy right now! The cats are the only one's loafing around. Say... shouldn't he be out getting gophers or something? • and of course, washing ALL the clothes! Someone pointed out that they thought this tool would work better than a traditional toilet plunger... YES! I totally forgot to mention that this is NOT a toilet plunger in blue. It's actually designed so that it draws water up inside the plunger and back out, creating additional movement of soap and water through the clothes. It comes apart in three pieces, so if you need to store it without the handle attached, you can easily remove it. This was really helpful when packing it in the camper! I'm a firm believer in "simple machines"; remember the kind we learned about in elementary school? They work efficiently and have little that can go wrong. I'd say the hand plunge washer would easily fit into that category and every home would do well to have one, even if it's just in case! 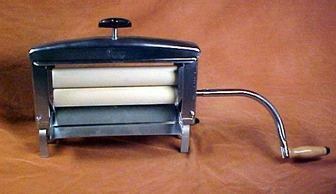 And don't forget... they have a hand crank wringer, too... in case you find you like the hand plunge washer so much you want to use it regularly. Thanks everyone! 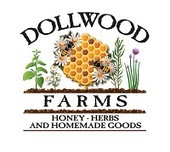 And thanks to Daniel and Abby Jo at Forgotten Way Farms. May your clothes always come out clean and bright! Welcome Friends! 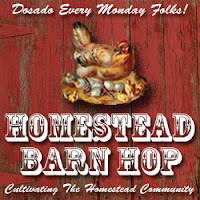 Monday and time to Barn Hop through your homesteads and share the happenings from the past week. I would like to report that I got a long list of projects done this week, or that I was ready for my goats and they finally arrived, or perhaps something exciting happened (okay, so fires can kind of be exciting, but I was thinking of something not so traumatic), but what I really have to report is... we got a lot of school done! Week 2 of homeschool and thankfully, routine is already starting to fall into place. Not perfectly, mind you, but better than Week 1. In some ways, I think the girls did better than me, but in all honestly, it was because I spent some of "my time" (cleaning, cooking, gardening, etc.) helping them to solidify their own routine and understand their new curriculum and that kind of thing. In the long run this is choosing the best; the ultimate priority during those hours is school and helping them to grow in character and spirit, so it's all good. I just have to keep remembering that when things I often think are important don't get done.